PRWeek's web editor Perry Simpson attended the event and recalls the sense of "power" in the room, but wonders how PR can have a diversity problem amid such a gathering. 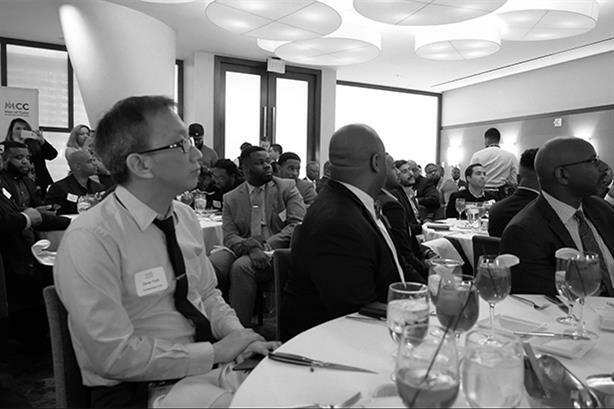 ColorComm — the lauded communications events and networking group for women of color, headed by Lauren Wesley Wilson — recently launched a new group, Men of Color in Communications (MCC) during a luncheon in D.C. that I attended. I haven’t been around PR long, but it soon became clear this industry, like many others, has a diversity problem. Research conducted for the National Black Public Relations Society in 2015 in partnership with Syracuse University’s Rochelle Ford showed that 62% of respondents didn’t have black male leadership in communications at their organization, and 47% didn’t have black male communicators at their company at all. To its credit, PR likes to confront its diversity issues; from one end with awards and panels on the progress that’s been made, and (somewhat paradoxically) from the other with think pieces and water cooler discussions among minorities who feel there’s a lot of work left to do. I spoke with several black communicators in the field, including Wilson, about what it’s like to be black in PR, and had been doing so for months while working on our recently publishedmini-documentary on the topic. So, going in, I understood there was a degree of dissonance between black PR pros’ perspective on diversity and inclusion in PR, and that of the industry at large. I showed up at the lunch not knowing what to expect. But our room at Charlie Palmer Steak quickly filled to capacity, with prospective attendees being turned away for space before lunch was even served. Wilson gave some opening remarks, dishing on the growth of ColorComm, how the men’s group came to fruition, and how this gathering of more than 65 black males in communications directly counters the notion that "we can’t find diverse employees." She was followed by Cameron Trimble, who co-founded MCC. Arthur "Art" Collins, founder and managing partner of theGROUP, took the reins from there, rousing the assembled with tales from his storied career. Collins spoke of his three formal positions as a communicator, and how each ultimately ended in failure. He was unapologetically black during a time when that sort of demeanor was especially dangerous, often mortally so. But each of those "failures" collectively confirmed what Collins felt he already knew, that he needed to become an entrepreneur and create the space the industry was denying him. It was a powerful anecdote. The three speakers were each inspiring in their own right, but the truly empowering moments came after Trimble asked the attendees to go around the room and stand, say their name and what they do, and tell the rest of us one need they have. It sounds like something straight out of a college classroom. But there was something incredibly powerful in hearing the work these black men were doing in this space — a space where there are apparently so few of us — and finding places where we could help each other. One man called for fellowship and guidance as he worked the agency ladder. Another asked for black filmmakers with stories to tell. Another asked for support from the assembled company in his efforts to inspire local D.C. highschoolers of color to pursue PR. The veterans in the room asked for mentees. I left feeling inspired, and more than that, empowered by the roomful of talented and able black men working in PR and media. But what I really want to see is how the industry at large responds to this, and other similar organizations. There was hope and positivity in that room at Charlie Palmer Steak, but there was something else too. That old resigned sense that we as black people are going to have to get our’s on our own, and fair enough. But PR prides itself on its commitment to diversity and inclusion. When, then, do stakeholders in the PR industry join the real diversity discussions, and the people having them, where they are? Sooner rather than later, and not just in February, I hope. Your call: How do you feel about the Cannes Lions changes?